Largehearted Boy: Book Notes - Sara Baume "Spill Simmer Falter Wither"
Book Notes - Sara Baume "Spill Simmer Falter Wither"
"A tour de force.... No writer since JM Coetzee or Cormac McCarthy has written about an animal with such intensity. This is a novel bursting with brio, braggadocio and bite. Again and again it wows you with its ambition…At its heart is a touching and inspiriting sense of empathy, that rarest but most human of traits. Boundaries melt, other hearts become knowable…This book is a stunning and wonderful achievement by a writer touched by greatness." 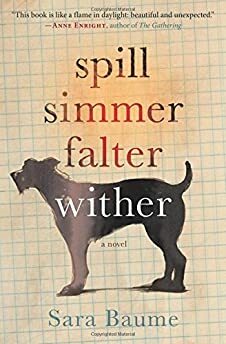 My debut novel, Spill Simmer Falter Wither, is written in the second person, spoken by a fifty-seven year old man, addressed to his one-eyed dog. The man's name ‘is the same word as for sun beams, as for winged and boneless sharks.' For his whole life, Ray has lived in a salmon-pink painted house in a seaside village. He doesn't have family, friends or any particular occupation. The locals regard him as strange. The story begins when he adopts a mistreated dog from a rescue sanctuary. The first half, Spill and Simmer, is set in his tumbledown house and its hinterlands. The second half, Falter and Wither is a road trip around rural Ireland. The scenery is fields and forests, gentle hills and overgrown ringforts, tangled boreens and cattle paths. For me, it's a story about the tremendous importance of companionship, about sadness and curiosity and compassion. When I started to think about creating a soundtrack for the novel, I remembered that, even though Ray listens to the radio incessantly, he plays no music of his own. Because of this, I decided to create a list of songs I wish he'd been able to listen to, which might have provided solace. Out of curiosity, I asked my Irish readers what they would choose for Ray. The answers I received were mostly unexpected – which was wonderful. I love the idea that the character I invented has since taken on an identity untainted by my tastes. "Ray would definitely enjoy quiet, classical stuff…" one reader told me. The novel is broken into four sections and plays out over the course of a year. Spill for spring, Simmer for summer, Falter for autumn, Wither for winter. In common with Vivaldi's master work, the mood and pace and colour changes in accordance with each season. Another suitably quiet, classical suggestion was "Speigel im Speigel" by Arvo Part. A cloying, yet peculiarly moving hit. "What a tale my thoughts could tell…" Lightfoot croons. Ray's thoughts are snarled with secrets; these lyrics paint an apt portrait, although "…and you won't read that book again because the end is just too hard to take…" is perhaps a bit too much of a giveaway. In keeping with the rise and fall of mood and season, I wanted a song which would mirror the delight Ray experiences at witnessing the arrival of summer. "To the rescue, here I am…" Marley sings, "I tell myself a new day is rising…"
I had to include at least one 'dog' song. Steven's first single captures One Eye's unqualified affection for his master, and vice versa. "All he asks of me is the food to give him strength…"
The salmon-pink painted house, which belongs to Ray's absent father, looms large throughout the novel. For me, it is a character in and of itself. The Animals also do a stirring version of "Please Don't Let Me Be Misunderstood" which Ray might also appreciate. Simon and Garfunkel were suggested by a reader, and are a brilliant choice, as perhaps every one of their bittersweet songs has a tone in common with the novel. I seriously considered "The Sound of Silence" but have settled on "Homeward Bound" because it includes the lyrics: "Every day's an endless chain of cigarettes and magazines…" / "Every town looks the same to me…"
Continuing the following of seasons, and reflecting the downward spiral of Ray's luck, this is an exquisitely heart-breaking song. "I don't want to wake up on my own any more…" Morrissey laments. Sad songs are what people play when they're sad anyway, and I don't see why Ray would be any different. "Back to the Old House" would also be a good choice from The Smiths. "I'd rather not go back to the old house, there are too many bad memories…"
Finishing as I began, with a quiet, classical piece. I am stealing from a different soundtrack - this is the music which brings David Lynch's The Elephant Man to a close.